About 2.5 kilometers from the U-i-dong bus terminal, one finds Dosunsa Temple, which was founded by Master Dosun (827-898) in 862, the second year of King Gyeongmun of the Silla Kingdom. After traveling far and wide, Master Dosun foretold that Buddhism would flourish at the Mt. Samgaksan and built Dosunsa Temple. His prophecy came true over 1,000 years after his death as Master Cheong-dam (1902-1971) of this temple helped Korean Buddhism flourish in the 20th centry. Master Dosun was a learned monk. He had a deep knowledge of astronomy and geography, and he introduced geomancy to Korea. He noticed the unusually auspicious features of Mt. Samgaksan and decided to build a temple there. Using his mystical power, he cut a huge boulder in two and carved a Maitreya Buddha on the surface. Today, that 20-feet-high stone Buddha is the source of much wonder and reverence. Many go to visit it and there are stories of people being cured of serious ailments after praying. Behind the temple, there is a path that leads to Baegundae and Insubong Peaks via Yong-ammun Gate. Opposite the temple is U-i Sanjang, a mountain cottage. 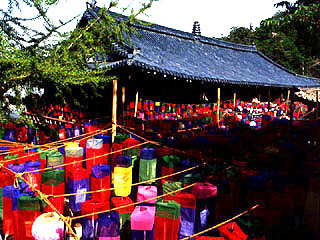 In front of the main building of the temple stands a building called 'Hoguk Chamhaewon. 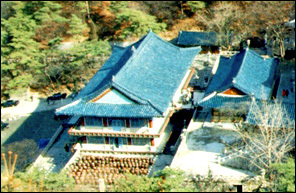 Completed in 1977, it is the largest comprehensive Buddhist center in Korea equipped with a projection room, a library, a faith counseling room and a training hall.